As a technology consultant, one of the most satisfying and rewarding aspects I get to enjoy is finding ways to improve the quality of (work) life for my clients. My client relationships typically start with clients sharing frustrations related to manual and duplicative data entry, the inability to find what they need, the time spent tracking down data inconsistencies, and in some cases the hours spent manually compiling reports for weekly meetings. As I work with clients and gain an understanding of their challenges and needs I almost always find that people are doing the best they can to serve their customers. Most of the time this ingenuity to meet demands comes in the form of workarounds like Excel spreadsheets, Access databases, file shares, etc. These fragmented workarounds, while good-intentioned, ultimately impair organizational productivity and negatively impact the customer experience. For organizations with operations that span different lines of businesses, territories or geographies the negative impacts are multiplied! The impacts from these types of productivity challenges prevent organizations from delivering a great customer experience. Employees had become absorbed in high-touch manual steps and data entry. Despite best efforts, these workarounds resulted in incomplete data which stifled customer marketing efforts. They also present real risks to the organization in terms of data security and handling of sensitive customer information and prevented leaders from gaining a set of organization-wide benchmarks. Here are just a few real life examples of productivity challenges I’ve seen in 20 years of working with clients, and how it was solved by using Microsoft Dynamics 365. Client 1 An individual spent upwards of 30-40 hours per month compiling, reconciling and formatting a report – every month for years. Reduced to 1 hour per month. Spent weeks gathering and analyzing data for an annual reporting process. Reduced to 1 hour per year. times per year. Building a contract is as simple as clicking a button. no official “system of record”. Use just one core system of record with all the data. version of “truth”. All extraneous spreadsheets for business operations were eliminated. All teams access the same information. These challenges also highlight how organizations could be wasting their most valuable resource – their people’s time and talent! Every minute of an employee’s time wasted on a repetitive mundane task comes with an opportunity cost. I’ve seen clients re-purpose extensive time spent on manually gathering, de-duplicating and mining data to ways that contribute to the organization’s mission in more valuable ways like analyzing, creative thinking, problem-solving, and decision-making. When people have to go to multiple systems to get the information they need this translates into big productivity losses across the company and has a negative impact on employee productivity, the customer experience and revenue. Implementing a solution like Microsoft Dynamics 365 (formerly Microsoft Dynamics CRM) can help your organization improve collaboration and data access, automate processes and enable your employees to spend more time strengthening existing customer relationships and pursuing new ones. If you are interested in discussing how you can be more efficient using Microsoft Dynamics 365 contact us today. 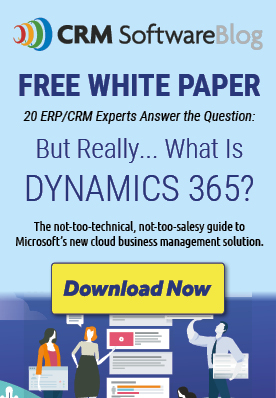 Is It Time for an Upgrade to Microsoft Dynamics CRM?